Every week, Making A Mark features an insanely talented person, giving them a little artistic brag space right here on IADW. This week it's the unique, all-ages-ish stylings of American illustrator Bob Strang. Who needs a shot of poochies playing poker when you can have Earth's Mightiest? Each time I scope out the awesomeness of this gathering of heroes I pick up some new detail, like the 'No Hulks' sign. No Wolverine either? Gee, I guess these must really be The Avengers. Now that's a Justice League! Not only do Atom and Blue Beetle make the grade, but the leading man is Billy Batson! Hopefully when DC get around to restoring the Captain Marvel family they take that tip and give Billy's alter-ego a prime JLA spot. To see Bob's take on pretty much EVERYONE, including The Inhumans, and Spider-Man, check out his online gallery right after the jump. and Cap's WWII helmet (presumably from the upcoming movie) sitting on top of the TV. Nice touch. 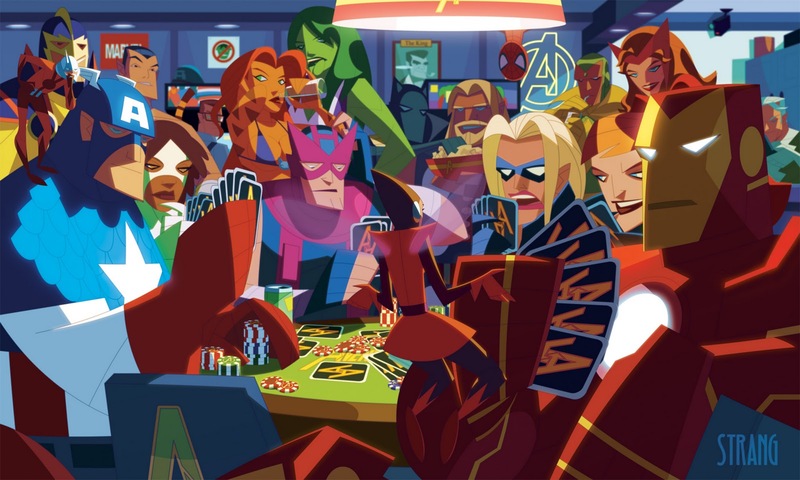 And the Vision is drinking a juicebox? That's definitely a straw in his mouth. This guy is amazing. 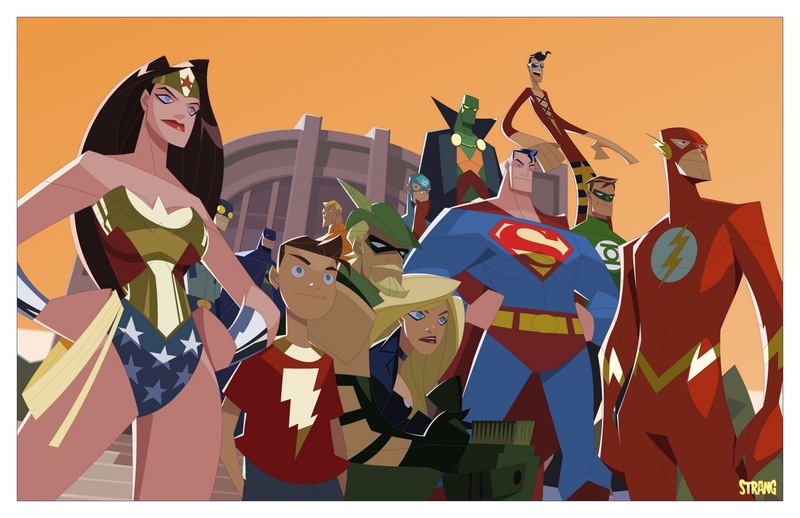 Love the Superfriends redesign too. Designs are better than WB studios came up with for Batman: The Brave and the Bold. Thanks Craig! Maybe the Vision is sucking down from an oil can? Or just doin' the Dew? Either way it is a pretty sweet set up. I love the Super Friends redesigns too, the retro 'S' on Superman really seems to fit and is a nice nod to the Fleischer Superman toons that are just awesome full-stop.